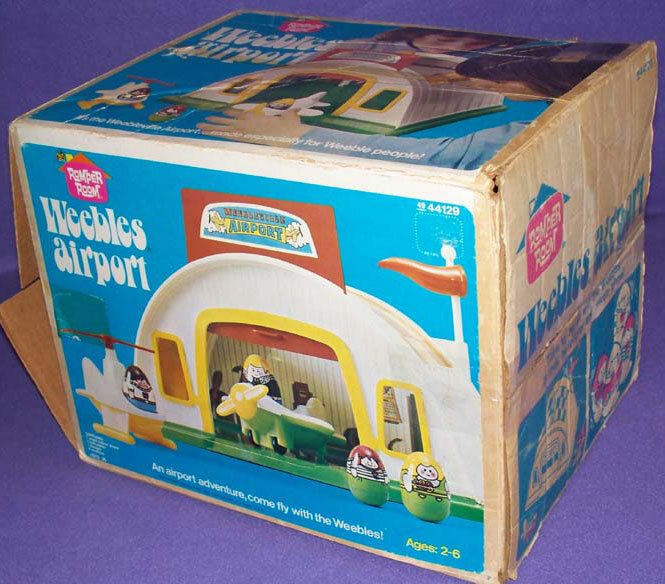 Description: This airport set is a smaller version of the #596 Weebles Airport. The airport only has a hanger (no office), and this set does not include an airliner. Airport - HTW406 - Rounded white airport hanger with 2 roof "doors" on top (forms a carry handle when closed). Each door slides down to allow play inside the hanger. The front of the airport hanger has a sign marked "Weebleville Airport" and an orange hanger door that lifts up. Hanger Sign: Blue litho with 2 planes, clouds, and marked "Weebleville Airport". Hanger inside Wall: Large litho that covered entire back wall of the hanger. The litho features lockers, a calendar, air pump, and shop tools. Office Sign: Small white litho marked "Office" in blue. Flag on Pole - HTW175 - White flag pole with an orange tube flag. Pole: 3-3/8" long (large ball on top); Flag: 3" long (spins on pole). Private Plane - HTW178 - Small 2-seat private plane with a green top, white bottom, yellow 2-blade spinable propeller on the front, and rolls on 2 small black wheels. Bottom of plane is marked, "©1973 Hasbro®, MADE IN USA". Helicopter - HTW179 - Small 1-seat helicopter with a yellow top, white bottom, a red 2-blade spinable propeller on the top, and white pontoon landing gear on the bottom. Bottom of plane is marked, "©1973 Hasbro®, MADE IN USA". HTW12 - Pilot - Blue base, yellow top (hair) pilot figure with a brown jacket (big fuzzy collar), marked "w" on one side. He holds a blue cap with "W" in white on the bill. Measures 2" tall. HTW8 - Boy - Blue base, brown top (hair) boy with a white shirt, red belt, and a red "w" on his chest. Has a slingshot in back pocket and marked, "©1973 Hasbro". Measures 1-3/4" tall. HTW7 - Girl - Green base, red top (hair) girl with a green, pink, and white striped shirt. She has a red flower on her chest and is marked, "©1973 Hasbro" on the back. Measures 1-3/4" tall. HTW6 - Woman/Mom - Green base, yellow top (hair) woman with a green sleeveless shirt, yellow belt, and a bouquet of flowers in her hand. Marked, "©1973 Hasbro" on the back. Measures 2" tall. Featured in 1974 JcPenny's Christmas Book, Page 325, $10.97. Other sets featured on Set Box (all with Peelable Weeble figures): #560 Playground, #594 Marina, #590 S.S. Littleputt, #566 Camp About.